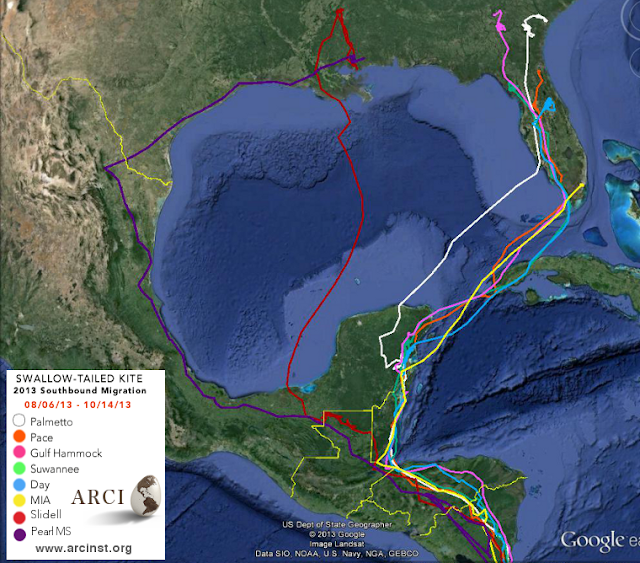 The eight Swallow-tailed Kites we are tracking by satellite left the U.S. by late August and settled into their Brazilian and Bolivian winter ranges by mid-October. As the temperature drops here in North America, it is increasing in South America where conditions are heavy with heat and precipitation. 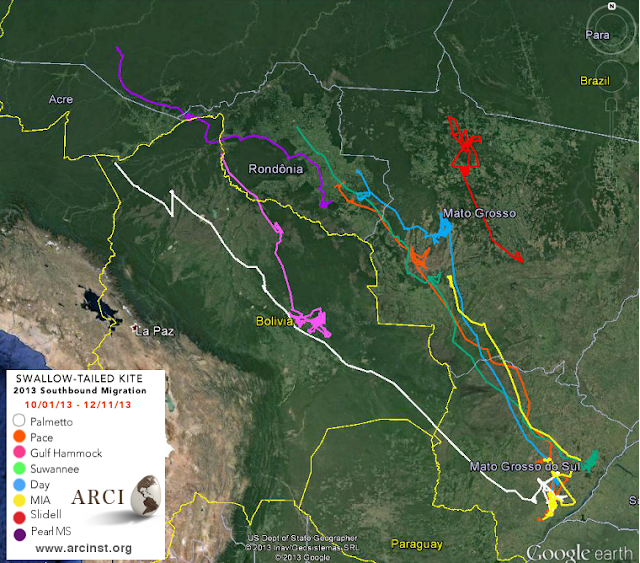 Ranges of 8 satellite-tracked Swallow-tailed Kites from 01 October 2013 to 11 December 2013. Pearl MS is in the state of Rhondonia Brazil, 70km south of Alta Floresta d’Oeste. From the aerial imagery, it looks like a matrix of forest and cattle pasture. Slidell spent 6 weeks near Juara, Mato Grosso, then headed south 390km on 30 November where she now is southeast of Nova Mutum. Gulf Hammock has been traveling over a stretch 100km west of Concepcion, Bolivia. She had a very similar winter range in 2012. Palmetto Bluff also traveled through Bolivia where she stayed last year, but this year she took her time, traveling through the country over a 20 day period, and finally settling in the state of Mato Grosso do Sul, Brazil. Suwannee has stayed west of Tres Lagoas, Mato Grosso do Sul since 12 October covering an area that stretches 70km north to south over mixed pasture, agriculture and forest patches along small rivers. Incredibly, MIA, Pace, Day and Palmetto Bluff all made their way to the same roost in Mato Grasso do Sul, Brazil. These birds, tagged at different times and places (Miami, Jacksonville, Daytona and Palmetto Bluff, respectively) converged on this area independently of each other over a period of 28 days. This is half our study population. Can you imagine how many thousands of Swallow-tailed Kites there may be in this one area? We also know from our many years of field studies on the Brazilian winter range that the Swallow-tailed Kites from the U.S. are flocking at this time with thousands of breeding and wintering Plumbeus Kites plus a large portion of the wintering Mississippi Kites from the U.S. This is a strong reminder of how important it is to protect these winter foraging and roosting habitats on the winter range and to ensure that there are compatible farming and logging practices. Swallow-tailed Kites that nest in the eastern portion of the species’ U.S. range (South Carolina, Georgia, and Florida) cross the Gulf of Mexico during their spring and fall migrations, but their routes differ depending on the season. Migrating southward at the end of the nesting season, they fly from southwestern Florida to the northeastern Yucatan Peninsula of Mexico either directly or with brief stops on Cuba. When they return in the spring, they depart from the Yucatan Peninsula and make landfall somewhere along the northern Gulf coast, from Louisiana to the Florida panhandle. During their spring or fall migrations, Swallow-tailed Kites from the western subpopulation (Alabama, Mississippi, and Louisiana) may fly across the Gulf of Mexico (See Slidell) or travel entirely overland (See Pearl MS), following the Gulf coastline through Louisiana, Texas, and Mexico. Our 8 satellite-tagged Swallow-tailed Kites, now settled into wintering locations in Southern Brazil and Bolivia, will start moving north in late January and early February. Watch to see whether Pearl MS and Slidell navigate across or around the Gulf and where the other birds come ashore when returning to their established nesting areas in February and March of 2014. On their southbound migration, the eastern subpopulation of Swallow-tailed Kites fly from southwestern Florida to the northeastern Yucatan Peninsula. The western subpopulation migrates via on overland route through Mexico or by crossing the Gulf.